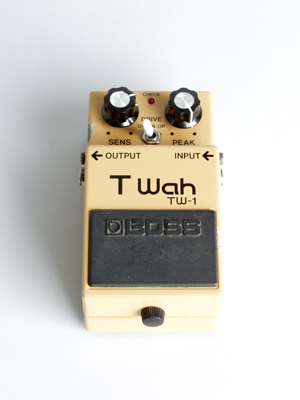 Boss T Wah TW-1 Model envelope filter Effect (1982), made in Japan, beige finish. Length is 4 3/4 in. (12.1 cm. ), 2 3/4 in. (7 cm.) wide, and 2 1/4 in. (5.7 cm.) in depth at side. Very Good Condition.